Pia graduated from the University of Cape Town in 1995. She worked in inpatient orthopaedics and outpatient settings before relocating to England in 2001. She has worked in the NHS as well as in a private hospital outpatient department where she took the role of clinical lead before moving into a private musculoskeletal clinic. 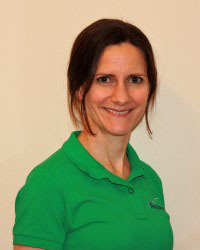 Pia is qualified in the use of acupuncture as well as being trained in clinical Pilates which she uses extensively in her practise. I have a huge interest in how the physical body functions and how it relates to our mental functioning. As a physiotherapist I believe it is important to assess the entire body, not only the injured area, to identify long-term solutions to mechanical problems and improve overall function and performance as well as solving the specific problems my clients present with. During my career I have been fortunate to have had many learning opportunities and developed my skills with the addition of acupuncture qualifications and clinical Pilates. I have also trained in the field of women’s health including the treatment of pelvic girdle pain during pregnancy using manual therapy techniques and acupuncture to good effect with these clients. During my time as a clinical lead in outpatients I had the opportunity to work closely with orthopaedic consultants in several specialities including shoulders, spinal orthopaedics and paediatric orthopaedics. Outside of my clinical work I run small group rehabilitative Pilates classes and enjoy the company of my 6-year-old daughter. I keep fit with yoga classes, running, swimming and regular Pilates practice of my own. My other hobby is travelling and with my family I am fortunate enough to indulge my wanderlust regularly.